On Sale Now! 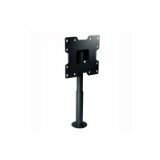 Save 10% on the Desktop Swivel Mount, Blk by Peerless-AV at Got Busted Mobile. MPN: HP432-002. Hurry! Limited time offer. Offer valid only while supplies last. The HP432-002 series flat panel desktop swivel mounts are designed to provide security and functionality for installations in the lodging industry. If you have any questions about this product by Peerless-AV, contact us by completing and submitting the form below. If you are looking for a specif part number, please include it with your message.